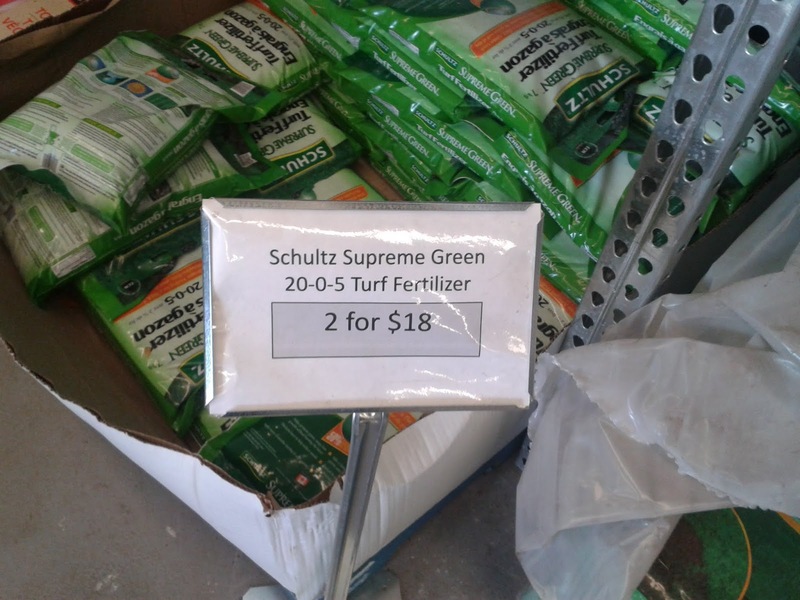 Michael Suddard: Wal-Mart Garden Centre Pricing: How Much for this Bag of Fertilizer? Wal-Mart Garden Centre Pricing: How Much for this Bag of Fertilizer? How much for Qty 1 Bag of Fertilizer? This past weekend I decided ﻿to do some work around including weeding and fertilizing the lawn. On a visit to Wal-Mart in Richmond Hill I visited the garden section to investigate what they had for some mulch and fertilizer. I picked up one bag of "Schultz Supreme Green Turf Fertilizer" clearly labelled "2 for $18.00". I reviewed the label to see how many bags I would require for what little grass I have. One bag seemed to suffice. I ventured onward with my shopping to grab some groceries and other household necessities and proceeded to the check out. Before leaving the store my wife and I, as we always do, reviewed our receipt. We stopped at the itemized listing for the fertlizer. Hmmm... $11.70 can't be right. We ventured over to the Customer Service Desk at the front of the store to inquire. With no one in line we were quickly greeted. The attendent, who ironically enough had "cashier" on her name tag, scanned the bag and explained that because I only had one bag it was at the regular price. She replied it was the scanned price is what the price was. I replied to this last claim by pointing out that not all the time was scanned price correct as sometimes the tag on the shelf is cheaper than what is scanned. This of course is why the Government of Canada created the Scanning Code of Practice which Wal-Mart volunteered to adhere to and the Richmond Hill store clearly posted the required label on it's front door. I also pointed out the shelf label in in this case was not clearly marked and the average consumer would believe if one bag was purchased it would cost $9.00. She replied the correct price is what was scanned in this case. I asked to speak to the Customer Service Manager. The Cashier paged the Customer Service Manager three times despite my wife and I witnessing one clearly marked "Customer Service Manager" on her name tag three cashes over replenishing the plastic bags. Another Customer Service Manager visited us at the front counter and I explained the issue. I also noted the Cashier at the Customer Service Counter in her actions may be unfortunatly leading this store to not live up to the Scanning Code of Practice which Wal-Mart had dutifully agreed to adhere to. She gave the same answer as the Cashier at the Customer Service Counter. I said I begged to differ and invited her to visit Garden Centre as I believed this was a Scanning Code of Practice issue. Together we retraced my steps to the Garden Centre and she carried the decently weighted bag with us. While walking there I inquired if someone from the Garden Centre could join us to review the issue. We happenned to find a gentleman with a handheld scanner. He explained, while we reviewed the fertlizer and the posted price that one bag was at regular price and the sale only happenned if you bought quantity two. I explained my position that this tag was unclear. A middle aged Wal-Mart customer ventured by to stop and inquire about something else. I asked him politly how much he thought one bag of fertilizer would be. His reply: $9.00. The Garden Centre employee said it was $11.70 and agreed upon it with the Customer Service Manager. I asked to speak with Store Manager on this issue. The Customer Service Manager and I left, not before she tried to put back my duly overpriced purchase of fertilizer. I said to her I have duly purchased that bag of fertilizer and have the receipt to prove it, please bring it along so the Store Manager can review this issue. The Store Manager retraced our steps back to the Garden Centre with the Garden Centre employee to review. He took a three second look a the pricepoint and said the Garden Centre employee that this item was not correctly priced as set out by Wal-Mart policy as there should be indication of what the price was if one of the products was purchased. The Store Manager said he would return in five minutes to show the Garden Centre employee how to properly print the pricing. The Store Manager returned with me to the Customer Service Counter carrying the bag of fertilizer. I stopped and waited with the Cashier I had visited earlier. The Store Manager instructed her to return the product, then input it under the $9.00 and then discount it under the Scanning Code of Practice. While the cashier was processing the transactions, the Store Manager said that I was very concientious in pointing out a confusing pricing issue. He said that I would be receiving the fertlizer under the Scanning Code of Practice (i.e. free in this case) and the pricing would be clearly marked. He thanked me for visiting his store and hoped, despite this situation, I would return again. I replied that I thanked him for his kindness. I left with my wife to a beautiful Saturday afternoon of sunshine and gardening.